Minnesota inhabits a lot of squirrels, specifically the grey squirrel population which is found in central and southern Minnesota. In the Twin Cities, you may have noticed that the squirrel population around the cities is very abundant and therefore many people have problems with squirrels. Also, with the harsh Minnesota winters, this increases the likelihood of squirrels seeking shelter in any area they find fit. When squirrels invade your home they can cause a lot of damage. Many people forget that they are rodents and have the same tendencies as rats and mice. What do you do if you have a squirrel infestation? Squirrels can be a huge nuisance, causing a lot of damage to your home, and potential health threats. Also, they are a hard critter to get rid of. Many times they invade attic space and other interior areas that are hard to access. When you have a squirrel invasion it is appropriate to seek professionals to help fix this problem. We will take our time to remove each individual from your home and also repair all of the openings, holes or gaps that they may be entering through. If necessary we will use screen or other hardware to seal any openings such as vents that squirrels may be using, or could in the future. Chimneys are also a place that squirrels like to enter through, and this usually poses more problems and we will need to come in and remove the animal through the fireplace before it gets loose inside of your home. Doing this job yourself can pose bigger problems, such as moving the squirrel from an isolated area into the entire house. Squirrels can be vicious and also carry disease. If you think you may have a squirrel or multiple squirrels entering into your home, do not wait to call a wild animal remover. If the squirrel has enough time it will nest and this will be harder to catch the squirrel and will cause more damage to your home. Squirrels are rodents and have the rodent teeth that destroy wood, wire, pipes, ducts and basically anything else that may be in the squirrels way or seem valuable to this animal.f you have a squirrel problem you are going to have to trap and remove them. Hiring a professional trapper such as Minnesota Wild Animal Management Inc. can help ensure the trapping is done in a timely and humane manner. 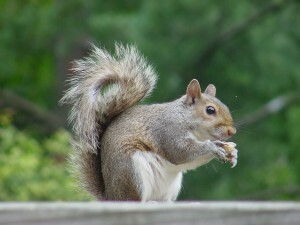 On top of removing the squirrels, we also fix the damage they have done, and repair your house so they will not return!